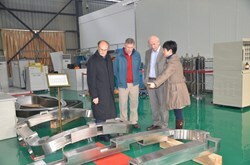 Magnet experts gather around the full-size dummy bottom correction coil prepared for vacuum pressure impregnation. The dummy coil is wrapped inside its glass-polyimide ground insulation (visible on the left side), enclosed inside a thin stainless steel sealed vessel and inserted inside a thick vacuum impregnation mould, clamped all around to provide accurate final dimensions. The ITER correction coils are an integral part of the ITER magnet system, forming a layer of coils inserted in between the toroidal and poloidal field coils. Some of them, such as the six bottom correction coils, will be among the first components to be installed during assembly thus requiring early delivery to the ITER site. On 4 and 5 December, the correction coil manufacturing line in China underwent a thorough check-up to assess whether it is now ready for the long marathon of correction coil manufacture. 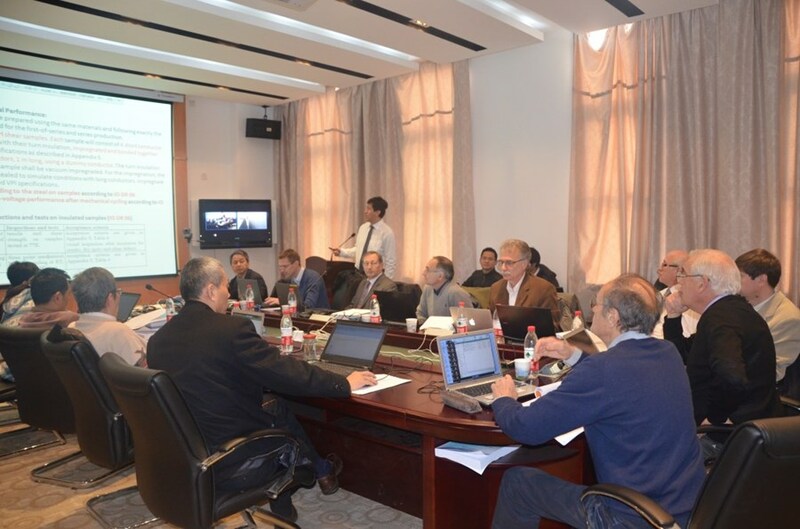 This critical examination was carried out by a group of "doctors" from Europe, Japan, USA and China under the chairmanship of Michel Huguet, former director of the ITER Naka site during the Engineering Design Activities for ITER. 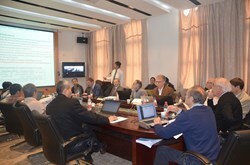 This first Manufacturing Readiness Review was organized by the ITER Organization and held at ASIPP (Hefei, China), the institute that was awarded the responsibility of correction coil manufacture by the Chinese Domestic Agency following the signature of the Procurement Arrangement in May 2010. Four years ago, in November 2009, the Final Design Review was held in Hefei for this component. Since that time, a new manufacturing line for the correction coils was designed, manufactured or procured, and commissioned by ASIPP, including the winding line, the resin system for vacuum pressure impregnation (VPI), and the laser welding system for case enclosure. All the manufacturing drawings have been designed and approved, the qualification of various manufacturing processes has begun, and the winding qualification is finished. The qualification items falling into the scope of the review included the winding of the 10 kA niobium-titanium (NbTi) conductor; the helium inlets and outlets which will provide supercritical cooling at 4.5 K; the terminal joints connecting the coil to the feeders; the glass-polyimide insulation and its impregnation by epoxy resin; the terminal service box hosting piping and insulating breaks; and the stainless steel case enclosing the winding-pack. 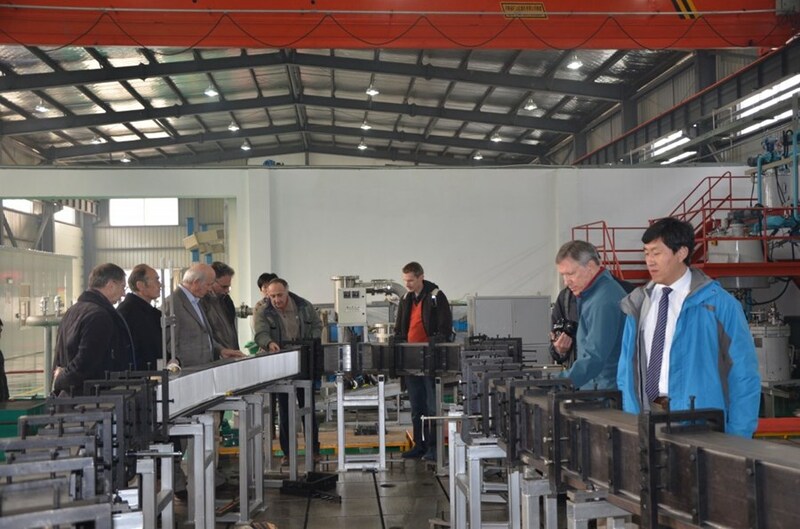 The requirements and deliverables for each one were presented by Li Hongwei, the Technical Responsible Officer at ITER China, and the qualification work was presented by Wei Jing and her team at ASIPP. 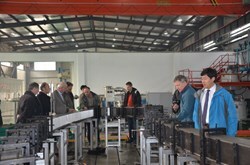 Magnet experts from Europe, Japan, USA and China hear a presentation on the preparation of the manufacturing line by Li Hongwei, Technical Responsible Officer for the correction coils. The review panel commended both for the quality of their presentations, fully impressed by the achievements of the R&D and qualification activities. In particular, conductor winding has successfully passed all qualification examinations, opening the way for the winding of the first-of-series ITER correction coil with real superconductor in 2014. A visit of the correction coil manufacturing workshop allowed the review panel the chance to see the various mockups built for the qualification of the manufacturing procedures, including the insulated side correction coil dummy double pancake and the bottom correction coil dummy double pancake (above right) ready for impregnation, as well the correction coil case models (above left).